THIS CAR IS NEW IN EVERY WAY. IT HAS NEVER BEEN IN RAIN OR SNOW. WAS ORDERED NEW IN 1985 BY THE PREVIOUS OWNER. I HAVE ALL ORIGINAL PAPERWORK (TO INCLUDE STICKER PRICE, SERVICE CATALOG/MANUAL) INCLUDING ORIGINAL BOSE CASSETTE STILL IN THE ORIGINAL SEALED BOX. AN EXTRA SET OF NEW FLOOR MATS STILL IN THE BOX. A SET OF ORIGINAL KEYS THAT HAVE NEVER BEEN IN THE IGNITION. THIS CAR WAS KEPT IN A CONTROLLED ENVIRONMENT INSIDE A BUBBLE BAG. THE CAR HAS NEVER BEEN HIT OR TOUCHED UP. THIS CAR LOOKS AND DRIVES LIKE THE DAY IT WAS BUILT IN BOWLING GREEN, KENTUCKY. 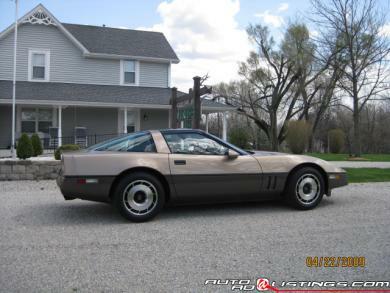 IF YOU�RE LOOKING FOR A 1985 CORVETTE, THIS IS THE ONE. THE COLOR IS A TWO TONE BRONZE (LIGHT OVER DARK) WITH BRONZE LEATHER INTERIOR. THERE IS NO WEATHER WORN/CRACKED RUBBER ON THIS CAR. CAR IS IN SHOW CONDITION. This is a NEW car!! !